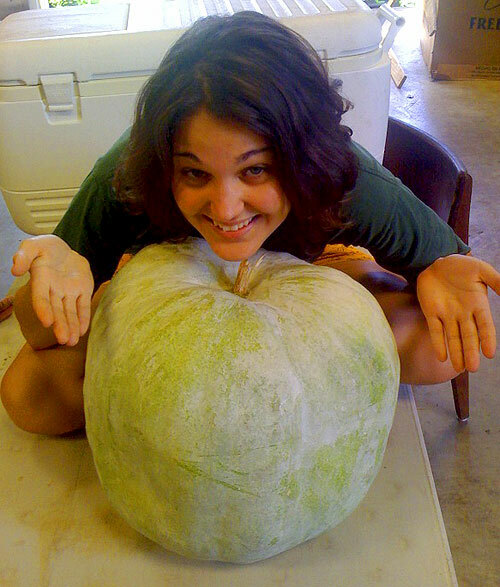 Rachel presents the winter melon. Photo by Daniel. One of the more unusual offerings at the Bee Heaven Farm summer fruit sales has been winter melon, also known as wax gourd. It’s called that because of the white, waxy coating on its green skin. A few weeks ago, I rode up with Farmer Margie to fetch them from C&B Farms up in Clewiston. The growers boxed and shipped the giant melons to various northern cities that have large Asian populations. I’m told the Chinese consider winter melon a cooling food, and that these melons grow much larger in China. 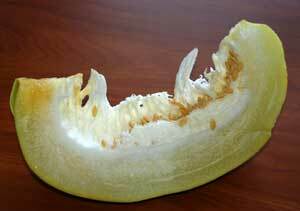 A slice of winter melon. These melons are huge and heavy! The one in the picture weighed at least 20 pounds. There’s no way that you could sit down and eat the whole thing, nor would you want to. Usually you buy it by the chunk. The flavor is very mild and slightly sweet, similar to a honeydew, and the flesh is white. The melon is very juicy and releases a lot of clear liquid after you cut it. A slice doesn’t keep very long in the frig, maybe a couple days at most, and then it starts to get mushy in places. If you’re not going to use all of it, wrap peeled and seeded chunks in plastic and freeze. Winter melon is best eaten cooked, not raw. Recipes abound on the Internet for winter melon soup, stir fry, drinks and even pickles. You can also freeze peeled and seeded chunks for later use. After sifting through all kinds of possibilities, I settled on making soup. I had all the ingredients on hand — homemade vegetable broth, a couple skinless chicken thighs, carrots, mushrooms, scallions, garlic and ginger. The melon chunks softened as they cooked and turned translucent. They took on the color and taste of the broth. I added salt and pepper, and finished with some toasted sesame oil for more flavor. The soup was good, but I can’t say for certain if it was cooling. It was hot soup, after all. 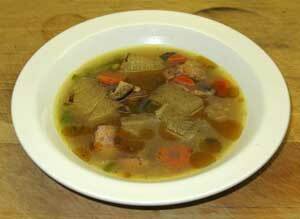 Chicken vegetable soup with chunks of winter melon and a drizzle of toasted sesame oil. Maybe next time I’ll try making a simple drink to test the cooling properties of the melon. A drink recipe I found on asianhealthyrecipe.com calls for one pound of melon and 5-6 cups of water. These are the instructions: Cut the melon into chunks and cook it skin, seeds and all, until some liquid comes out of the melon. Then add water, bring to a boil. Remove from heat. Add honey to taste, and serve either hot or cold. The recipe didn’t say if you’re supposed to strain the chunks out, but if you did that, I suppose you could eat the melon in a separate dish, maybe mixed in with something else. (It is, after all, quite mild flavored.) The drink is supposed to be cooling — and slimming, if you leave out the honey. Have you tried winter melon? What recipes do you have for it?